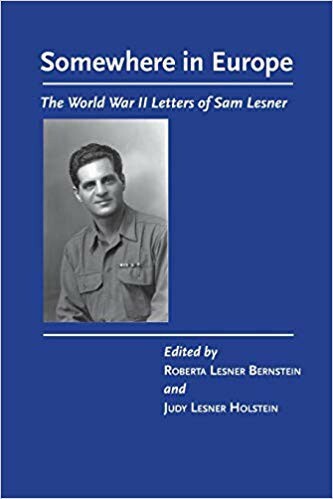 Book: "Somewhere in Europe: The World War II Letters of Sam Lesner"
Authors: Roberta Lesner Bernstein and Judy Lesner Holstein (Rabbi Ed Bernstein's mother and aunt). Join us for a special conversation with Roberta Lesner Bernstein & Judy Lesner Holstein. There is a $5 donation request toward CSK's Adult Learning Fund. Roberta Lesner Bernstein is Rabbi Ed Bernstein's mother, and Judy Lesner Holstein is his aunt! Sam Lesner was drafted into the Army in February 1944. For the next 20 months, he served in the Army Medical Corps of the 130th General Hospital in the ETO. He wrote daily letters to his wife Esther, where he talked about the wall in all aspects. The letters are lyrical, filled with pathos, a grim picture of brutality of war, and the urgency of defeating the anti-semitic, racist Nazi enemy. Upon returning home, Sam Lesner his these letters. It wasn't until after his passing that his daughters accidentally found his box of letters. This first hand eye witness account tells what really happened that was not allowed to be included in letters sent from the battlefields.